Background: The dilated aorta in adults with bicuspid aortic valve has been shown to have different shapes, but it is not known if this occurs in children. This observational study was performed to determine if there are different shapes of the dilated aorta in children with bicuspid aortic valve and their association with age, gender, hemodynamic alterations, and degree of aortic enlargement. Methods: One hundred and eighty-seven echocardiograms done on pediatric patients (0 - 18 years) for bicuspid aortic valve, during 2008, were reviewed. Aortic valve morphology, shape/size of the aorta, and pertinent hemodynamic alterations were documented. Aortic dilation was felt to be present when at least one aortic segment had a z-score > 2.0; global aortic enlargement was determined by summing the aortic segment z-scores. 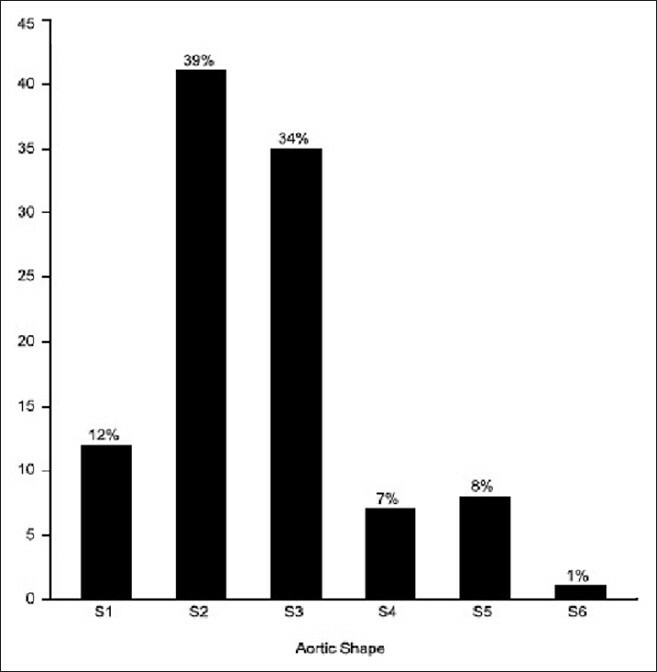 The aortic shape was assessed by age, gender, valve morphology, and hemodynamic alterations. Results: Aortic dilation was present in 104/187 patients. The aorta had six different shapes designated from S1 through S6. There was no association between the aortic shape and gender, aortic valve morphology, or hemodynamic abnormalities. S3 was the most common after the age of six years and was associated with the most significant degree of global aortic enlargement. Conclusions: The shape of the dilated aorta in children with bicuspid aortic valve does not occur in a uniform manner and multiple shapes are seen. S2 and S3 are most commonly seen. As aortic dilation becomes more significant, a single shape (S3) becomes the dominant pattern. Enlargement of the aorta distal to the valve was initially felt to be 'post stenotic dilation'  secondary to hemodynamic abnormalities  and was considered to be rare before five to six years of age. It was subsequently demonstrated  that adults with a bicuspid aortic valve developed aortic dilation when no significant hemodynamic abnormalities were present. The dilated aorta in adults with bicuspid aortic valve has been shown to have different shapes,  but it is not known if this occurs in children. As the shape of the dilated aorta in children with bicuspid aortic valve has not been described, it is the purpose of this study to: (1) Describe the shape of the dilated aorta, (2) associate the shape with age, gender, bicuspid aortic valve morphology, and pertinent hemodynamic abnormalities, and (3) determine which shape is associated with the most significant degree of global aortic enlargement. The study was approved by the Institutional Review Board at the Primary Children's Medical Center and the University of Utah, which felt that informed consent was not needed, because this was a retrospective review of the clinically obtained data. Procedures followed during the study were in accordance with the ethical standards of the revised Helsinki Declaration, 2000 and 2002. The echocardiographic database (Syngo® Dynamics, Siemens Siemens Medical Solutions USA, Inc.) used at our institution was searched for echocardiographic reports containing the term 'bicuspid aortic valve' or 'BAV' generated between January and December 2008. A total of 299 patients were identified. Patients (112) with a unicuspid aortic valve, tricuspid aortic valve, aortic valve surgery or replacement, inadequate imaging of the aortic valve, inadequate imaging of the aortic root/ascending aorta, inability to determine if the patient had coarctation of the aorta, Loeys-Dietz syndrome, Marfan syndrome, Turner's syndrome, the wrong diagnosis, age > 18 years, fetal echo, or inadequate information to calculate the z scores were eliminated from the study. A total of 187 patients were included in the study. The patient's age, gender, aortic segment z-scores, pertinent hemodynamic abnormalities (aortic stenosis, aortic insufficiency, combined aortic stenosis + insufficiency, coarctation) were obtained from the echocardiographic report. The echocardiogram was reviewed by a single author (CRM), to confirm that the patient did indeed have a bicuspid aortic valve, determine the aortic valve morphology (right/left, right/non or left/non-cusp fusion), and the accuracy of the z-score measurements. Where there was concern that the z-scores in the echocardiographic report were not accurate, the aortic segments were measured again and the z-scores recalculated. The aortic shape was documented and since there were more aortic shapes than noted in adult patients, ,, a unique classification scheme was developed as follows: S1 - normally shaped aorta, S2 - enlarged ascending aorta, S3 - effacement of the sinotubular ridge, S4 - Marfan-like, S5 - enlarged sinus of Valsalva and ascending aorta, S6 - normal annulus and proximal sinus of Valsalva, enlarged distal sinus of Valsalva, enlarged sinotubular ridge, and enlarged ascending aorta [Figure 2]. Aortic dilation was considered to be present when a z-score of at least one of the aortic segments was 2.0 or greater. In order to determine the degree of global aortic dilation the z-scores of each aortic segment were combined as follows: Annulus z-score + sinus of Valsalva z-score + sinotubular ridge z-score + ascending aorta z-score. We defined mild dilation as a combined z-score of < 8.0, moderate dilation as 8.0-11.99, and severe dilation as 12.00 or greater. 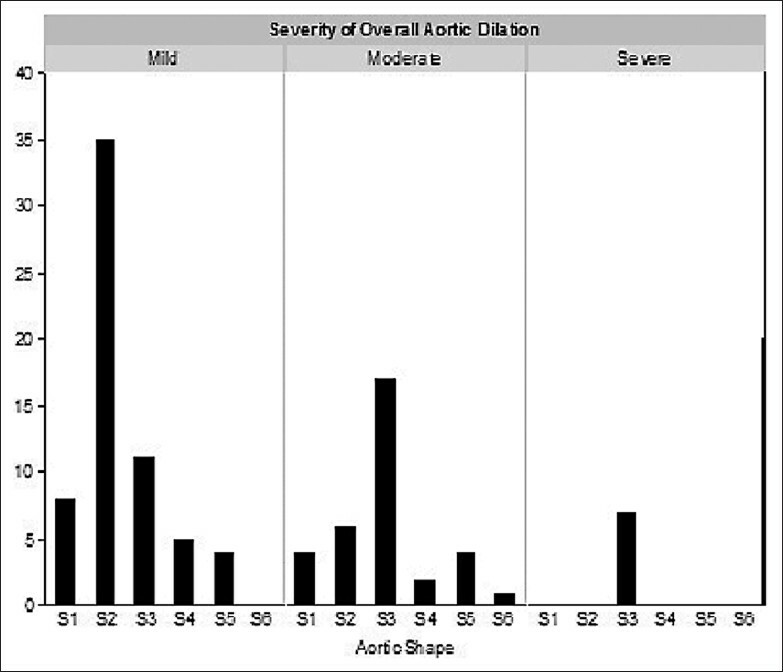 Descriptive statistics were used to determine the frequency of the different aortic shapes, the degree of aortic dilation, aortic segment z-scores, and global aortic size. These were associated with aortic valve morphology, age, gender, and the presence or absence of a pertinent hemodynamic abnormality. P values were determined by using the One-Way Analysis with Students t-test and considered statistically significant if less than or equal to 0.05. Statistical analysis was performed using the JMP® Statistical Software (ASA, Cary, North Carolina, USA). The age range of the 187 patients was from one day to eighteen years (mean 7.9 years); 144 (77%) were male and 43 (23%) female; and the male to female ratio was 3.4: 1. Right/left fusion was seen in 135 patients (72%), right/non-fusion in 51 patients (27%), and left/non-fusion in one patient (1%). Aortic dilation was present in 104 (56%) patients. Hemodynamic abnormalities were present in 123/187 (66%), and consisted of aortic stenosis, aortic insufficiency (1 + or greater; patients with isolated trivial aortic insufficiency were considered not to have a hemodynamic abnormality), combined aortic stenosis + aortic insufficiency, and coarctation (repaired - 50, unrepaired - 4). There were no associated cardiac defects that would affect the size or shape of the aorta. In the 104 patients with bicuspid aortic valve and aortic dilation, six different aortic shapes were noted [Figure 2]. S1 was seen in 12 (12%), S2 in 41 (39%), S3 in 35 (34%), S4 in seven (7%), S5 in eight (8%), and S6 in one (1%) [Figure 3]. S2 (34%) and S3 (35%), the most common patterns, were seen with equal frequencies in males and females. The frequency of the different aortic shapes varied with age. S2 (seen in 53% of the patients) was the most common up to age six, after which S3 (seen in 47% of patients) became the most common [Figure 4]. Regardless of the aortic valve morphology, S2 and S3 were the most frequent patterns seen. In patients with right/left fusion, S2 (36%) and S3 (36%) were seen with equal frequency, while in those with right/non-fusion, S2 (48%) was found more commonly than S3 (30%). The one patient with left/non-fusion had an S2 shape [Figure 5]. Hemodynamic abnormalities were seen in 65/104 (63%) patients with aortic dilation. Larger aorta, determined by the combined mean z-score, were seen in patients with hemodynamic abnormalities, and an S3 or S5 shape compared to those without hemodynamic abnormalities. 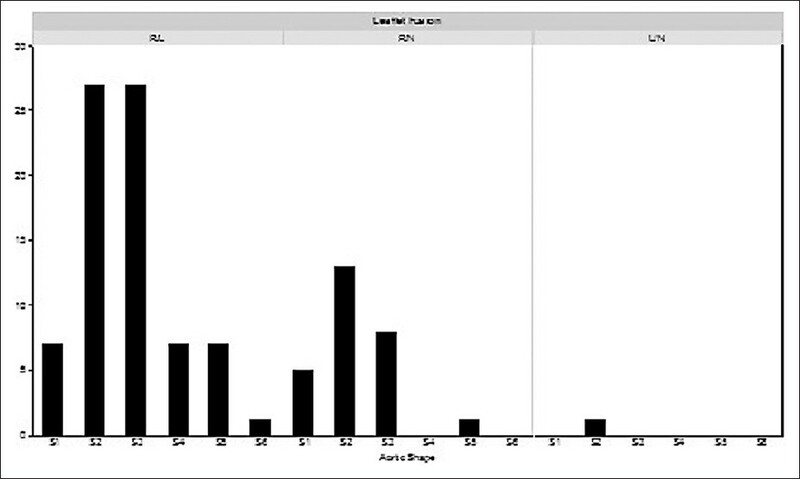 In patients with an S1, S2, or S4 shape, the combined mean aortic z-score was similar or larger in patients without hemodynamic abnormalities compared to those with hemodynamic abnormalities [Figure 6]. 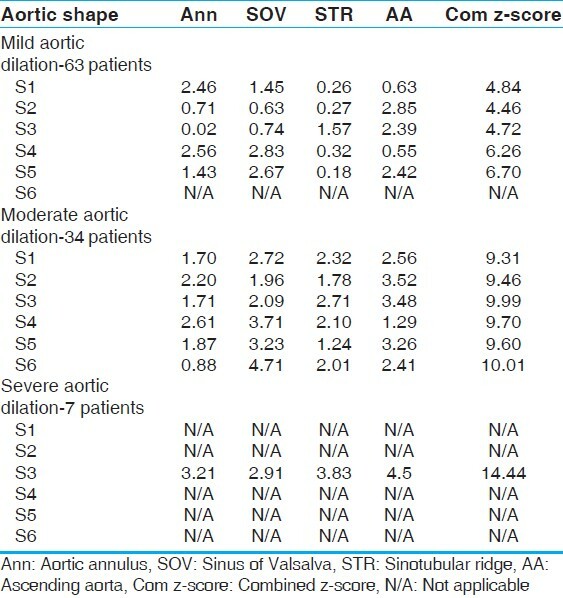 Regardless of age, gender, or bicuspid aortic valve morphology, mild overall aortic dilation was most commonly seen in those with an S2 shape, moderate in those with an S3 shape, and severe only in those with an S3 shape [Table 1], [Figure 7]. In the 83 patients with bicuspid aortic valve and no aortic dilation, S1, as would be expected, is the most common shape seen (51/83-61%). Other shapes include: S2 (12/83-14%), S3 (19/83-23%), and S4 (1/83-1%). In patients with an S1 shape the z-scores of the aortic annulus, sinus of Valsalva, and sinotubular ridge do not vary significantly from those with one of the other aortic shapes. However, the ascending aorta z-scores in patients with either an S2 shape (mean S1 z-score 0.28, mean S2 z-score 1.24, P = 0.008) or S3 shape (mean S1 z-score 0.28, mean S3 z-score 0.78, P = 0.03), while within the range of normal, are significantly larger than those with an S1 shape. This study demonstrates that in children with bicuspid aortic valve and aortic dilation the aorta can assume one of the six different shapes, with the two most common ones being S2 and S3. These findings differ somewhat from those in adults, where only four types of aortic dilations (aortic root and ascending aorta; one study  has also included the transverse arch, which has not been evaluated in our study) have been described, ,, corresponding to shapes S1, S2, S3, and S4. Thus, it appears that as one ages, the S5-shaped aorta assumes another shape. As only one patient has had the S6 shape, and it has not been followed over time, it is difficult to determine if this is a unique, rare form of dilation or if it will eventually assume a different shape. The aortic shape is not associated with gender or aortic valve morphology, but does appear to evolve with age. The most predominant shape seen in children less than six years of age is S2, but S3 becomes the most common shape from age six to eighteen years. This finding suggests that during childhood, aortic dilation most commonly begins in the ascending aorta giving the aorta an S2 shape, with subsequent effacement of the sinotubular ridge, causing the aorta to assume an S3 shape during late childhood and adolescence. 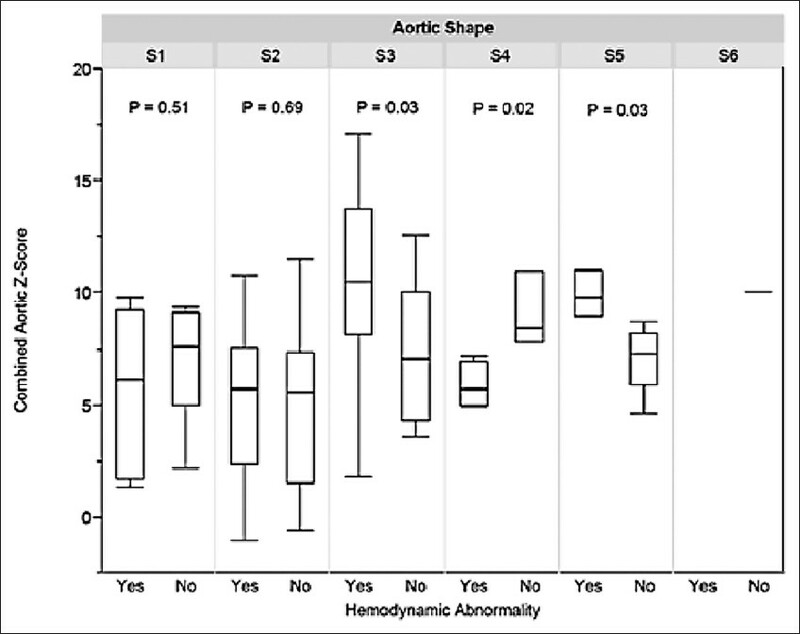 Although patients with an S3 or S5 shape are more likely to have a hemodynamic abnormality, there is no clear-cut association between having a hemodynamic abnormality and a specific aortic shape. S3 is the aortic shape associated with the most significant degree of global aortic enlargement, with severe enlargement occurring only in those with an S3 shape and in patients as young as three years. This finding raises some very interesting questions. Why are S3-shaped aortas larger? Do patients with an S3 shape have a more malignant form of aortopathy associated with the bicuspid aortic valve? Will patients with an S3 shape have a higher incidence of aortic dissection? Although such questions will need to be answered by future studies, what is evident from our data is that children with severe aortic enlargement have an S3-shaped aorta. 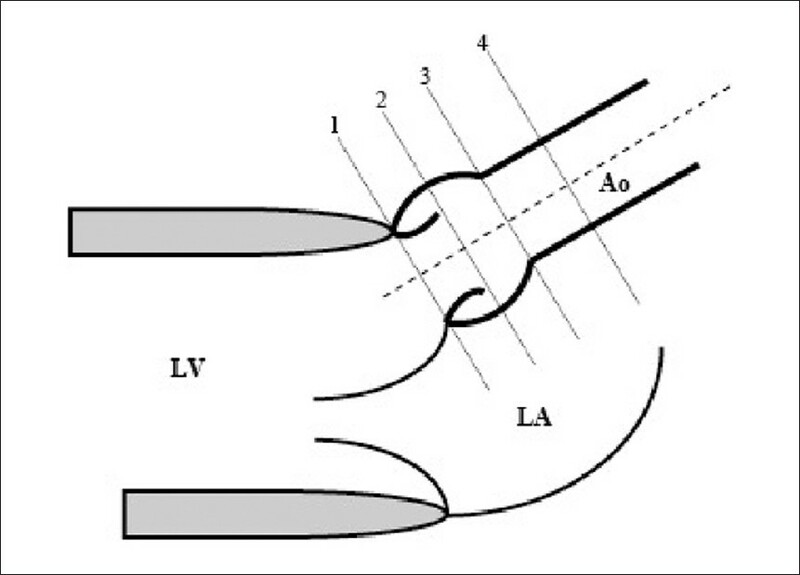 Thus, although the optimum time interval for following a child with bicuspid aortic valve and aortic dilation has not been defined, it seems reasonable that patients with an S3-shaped aorta must be followed more frequently for progressive aortic dilation, for example, on a biannual or annual basis. It is noteworthy that dilation of the aorta in children with bicuspid aortic valve is, for the most part, distinct from that seen in the Marfan syndrome. Aortic dilation in the Marfan syndrome predominantly results in dilation of the aortic sinuses of Valsalva. As noted by others,  the results from this study demonstrate that dilation of the aorta with a bicuspid aortic valve is generally not just confined to the aortic sinuses of Valsalva, but affects the entire aortic root and ascending aorta. Interestingly, some of the aortas in patients with bicuspid aortic valve and no aortic dilation had S2 or S3 shape. Although these aortas were not dilated, the ascending aorta was larger in these patients compared to those with a normally shaped (S1) aorta, suggesting that abnormal dilation could have already begun. The study is a retrospective review of patients undergoing echocardiography for bicuspid aortic valve and some of the conclusions reached would be more robust if they had been obtained in a prospective longitudinal study. In addition, a longitudinal study may be able to provide answers to some of the questions raised about the S3 shaped aorta. A better understanding of the pathological differences among the different aortic shapes could have been better appreciated if tissue from the aortic walls had been available for analysis. None of the patients included in this study had an aortic dissection, rupture, or had undergone surgical replacement of their aortic root/ascending aorta. Thus, it is difficult to predict if a particular aortic shape predisposes to aortic dissection, rupture, or early aortic replacement. The shape of the dilated aorta in children with bicuspid aortic valve does not occur in a uniform manner and multiple shapes are seen, with the two most common shapes being S2 and S3. 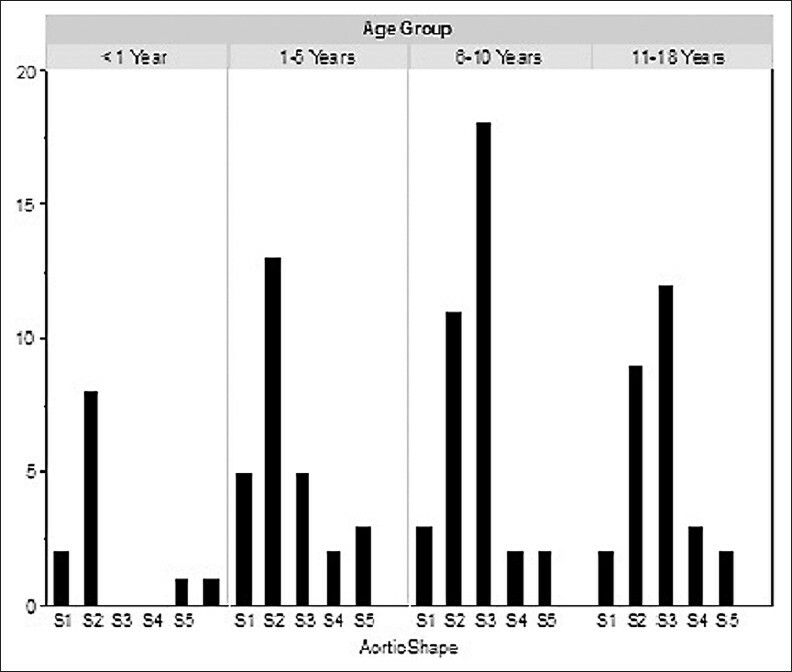 In children less than six years of age, the most common shape is S2, while the S3 shape is more common in older children and adolescents, suggesting that the aortic shape changes with age. Bicuspid aortic valve morphology, gender, and hemodynamic abnormalities do not appear to have a significant influence on the aortic shape seen in children with bicuspid aortic valve. As the severity of aortic dilation increases, the aortas in this series all had a common shape, S3. This suggests that children with bicuspid aortic valve and an S3-shaped aorta may have an increased risk of developing earlier, and more significant, aortic dilation, requiring a closer clinical follow-up. 1. Edwards JE. The congenital bicuspid aortic valve. Circulation 1961;23:485-8. 2. Basso C, Boschello M, Perrone C, Mecenero A, Cera A, Bicego D, et al. An echocardiographic survey of primary school children for bicuspid aortic valve. Am J Cardiol 2004;93:661-3. 3. Nistri S, Basso C, Marzari C, Mormino P, Thiene G. Frequency of bicuspid aortic valve in young male conscripts by echocardiogram. Am J Cardiol 2005;96:718-21. 4. Roberts WC. The congenitally bicuspid aortic valve. A study of 85 autopsy cases. Am J Cardiol 1970;26:72-83. 5. Lewin MB, Otto CM. The bicuspid aortic valve. Adverse outcomes from infancy to old age. Circulation 2005;111:832-4. 6. Fedak PW, Verma S, David TE, Leask RL, Weisel RD, Butany J. Clinical and pathophysiological implications of a bicuspid aortic valve. Circulation 2002;106:900-4. 7. Tawes RL, Berry CL, Aberdeen E. Congenital bicuspid aortic valves associated with coarctation of the aorta in children. Br Heart J 1969;31127-8. 8. Holmes KW, Lehmann CU, Dalal D, Nasir K, Dietz HC, Ravekes WJ, et al. Progressive dilation of the ascending aorta in children with isolated bicuspid aortic valve. Am J Cardiol 2007;99:978-83. 9. Beroukhim RS, Kruzick TL, Taylor AL, Gao D, Yetman AT. Progression of aortic dilation in children with a functionally normal bicuspid aortic valve. Am J Cardiol 2006;98:828-30. 10. Beroukhim RS, Roosevelt G, Yetman AT. Comparison of the pattern of aortic dilation in children with the Marfan's syndrome versus children with a bicuspid aortic valve. Am J Cardiol 2006;98:1094-5. 12. Braverman AC. Bicuspid aortic valve and associated aortic wall abnormalities. Curr Opin Cardiol 1996;11:501-3. 13. Flyer DC. Aortic Outflow Abnormalities. In: Fyler DC, editor. Nadas' Pediatric Cardiology. Philadelphia: Hanley and Belfus, Inc.; 1992. p. 510-1. 14. Friedman WF. Aortic Stenosis. In: Adams FH, Emmanouilides GC, Riemenschneider TA, editors. Moss' Heart Disease in Infants, Children, and Adolescents 4 th ed. Baltimore: Williams and Wilkins; 1989. p. 224-35. 15. Keane MG, Wiegers SE, Plappert T, Pochettino A, Bavaria JE, Sutton MG. Bicuspid aortic valves are associated with aortic dilatation out of proportion to coexistent valvular lesions. Circulation 2000;102:III35-9. 16. Neutze JM, Calder AL, Gentiles TL, Wilson NJ, et al. Aortic Stenosis. In; Moller JH, Hoffman JIE, editors. Pediatric Cardiovascular Medicine. Philadelphia: Churchill Livingstone; 2000. p. 511-51. 17. Pachulski RT, Weinberg AL, Chan KL. Aortic aneurysm in patients with functionally normal or minimally stenotic bicuspid aortic valve. Am J Cardiol 1991;67:781-2. 18. Schaefer BM, Lewin MB, Stout KK, Gill E, Prueitt A, Byers PH, et al. The bicuspid aortic valve: An integrated phenotypic classification of leaflet morphology and aortic root shape. Heart 2008;94:1634-8. 19. Sluysmans T, Colan SD. Theoretical and empirical derivation of cardiovascular allometric relationships in children. J Appl Physiol 2005;99:445-57. 20. Bonow RO, Carabello BA, Chatterjee K, de Leon AC Jr, Faxon DP, Freed MD, et al. 2008 focused update incorporated into the ACC/AHA 2006 guidelines for the management of patients with valvular heart disease: A report of the American College of Cardiology/American Heart Association Task Force on Practice Guidelines (Writing Committee to revise the 1998 guidelines for the management of patients with valvular heart disease). Endorsed by the Society of Cardiovascular Anesthesiologists, Society for Cardiovascular Angiography and Interventions, and Society of Thoracic Surgeons. J Am Coll Cardiol 2008;52:1-142. 21. Bauer M, Gliech V, Siniawski H, Hetzer R. Configuration of the ascending aorta in patients with bicuspid and tricuspid aortic valve disease undergoing aortic valve replacement with or without reduction aortoplasty. J Heart Valve Dis 2006;15:594-600. 22. Fazel SS, Mallidi HR, Lee RS, Sheehan MP, Liang D, Fleischman D, et al. The Aortopathy of bicuspid aortic valve disease has distinctive patterns and usually involves the transverse aortic arch. J Thorac Cardiovasc Surg 2008;135:901-7. 23. Abbott ME. Coarctation of the aorta of the adult type. Am Heart J 1928;3:574-618. 24. Mordi I, Tzemos N. Bicuspid aortic valve disease: A comprehensive review. Cardiol Res Pract 2012;2012:196037. 25. Randhawa AK, Mishra G, Gogineni SB, Shetty S. Marfan syndrome: Report of two cases with review of literature. Niger J Clin Pract 2012;15:364-8. 3 Is routine computed tomography angiography justified in patients undergoing aortic valve replacement for bicuspid aortic valve disease?